Speaking with the most ancient of messages, The Social Network uses them to comment on the society it was made for. It grabs the digital generation with its endlessly entertaining spouts of dialogue and glossy visuals and shows them the story of how they came to be that way. 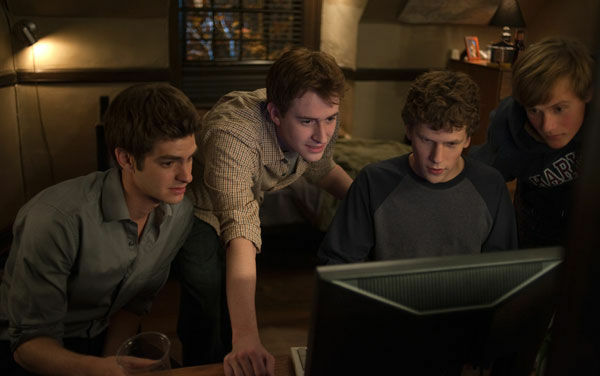 It starts by showing us what fueled Mark Zuckerberg (Jesse Eisenberg) to start his digital empire. His motivation is propelled by the same fuel of many geniuses, kings, and tyrants- rejection, loneliness, and a nasty mean streak. When his girlfriend (Rooney Mara) dumps him, he takes his rage out through his blog. This leads him to make a site called Facemash, which has Harvard’s gentlemen casting judgment on the ladies by picking which ones are the prettiest. In his infinite quest to be considered a member of the societal elite, Zuckerberg will stop at nothing. He creates a site for people to connect through, and it thrills him to be the gatekeeper, but this quest costs him all of his friends. When he finally gets to the top, like so many tragic American anti-heroes, he is there alone. Whether he is left wanting or satisfied depends on how you interpret that final, cryptic gaze of his. The center of the movie is held by Zuckerberg and the two parties who sued him over matters relating to Facebook. One is his best friend Eduardo (Andrew Garfield), who claims he was forced out of the company and not given adequate compensation. The others are three members of an elite Harvard society who claim they commissioned Zuckerberg to create a site with a concept identical to the website that would become Facebook. Sorkin’s screenplay smartly shies from flat-out convicting Zuckerberg of these crimes. Instead, he maps out the scandals and presents each as much as the facts allow. Fincher, being the brilliant visual artist that he is, paints them onto the canvas with a fluidity that makes it seem like more than a computer-program driven court procedural. After the countless work that each of these distinctly different but talented artists have done, they now work together in a way that makes this film the shining jewel in their careers. Sorkin confesses to writing stories about people in bland rooms talking, and Fincher is noted for his dark visual flair. He takes Sorkin’s talking heads and puts them in pulsating night clubs, and makes a pit stop for a beautifully filmed crew race set to classical music. Writer and director meet in the middle here, and it’s an admirable result. As with all excellent screenplays or successful direction, some credit must be given to the casting director as well. Bringing a cast of such young, talented actors to the set and asking them to expose the dark side of the thing that fuels their popularity is not a simple thing to do. Add in the fact that Fincher, a notorious perfectionist, may call on them to do a single take 100 times, and it is definitely no cake walk. Here we sit with one of the finest ensembles of the year, with many star-making performances. Heading this group is Jesse Eisenberg. His career has always made him the geek who triumphs, but now he gets to play one with real complexity. He nails it, finding the hidden emotion and drive buried beneath Mark Zuckerberg’s endless chill. As his former best friend Eduardo, Andrew Garfield gives the film’s most emotional performance. He unleashes the fury of betrayal and shows us the fear of being left behind that all the characters inevitably feel. Justin Timberlake also turns in a good supporting performance as Napster founder Sean Parker, who wants in on the Facebook action. A music artist portraying the man who cost the industry billions may not seem fair, but Timberlake keeps it cool and plays Parker from all angles. 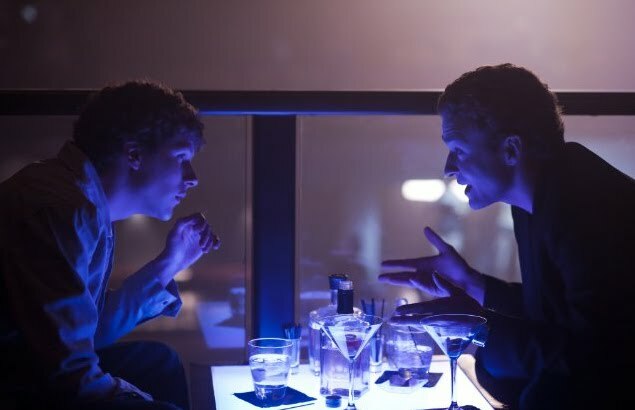 You’d be hard pressed to find a weirder success story this year than The Social Network. A mixed bag of talents doesn’t always produce an impressive result, but this story of our digital times fueled by the wisdom from thousands of years before it will have audiences Facebooking for weeks. This entry was posted in Best Picture Nominee, Reviews and tagged Aaron Sorkin, Andrew Garfield, Andrew Garfield New Spiderman, Best Actor nominee, Best Adapted Screenplay nominee, Best Director nominee, Best movies of 2010, Best Picture Nominee, David Fincher, Facebook, Facebook movie, Harvard, Jesse Eisenberg, Justin Timberlake, Mark Zuckerberg, Napster, The Social Network, Trent Reznor by matterspamer. Bookmark the permalink.